Many rural communities continue to face a legal services crisis. Some communities simply don’t have enough lawyers. Alternatively, there are enough lawyers, but their fees exceed the amount that clients can or wish to pay. But now, according to this story, one innovative firm, The Law Shop located in Van Meter Iowa has a solution: unbundled or ala carte legal services. Of course, unbundled legal services aren’t a new concept – I’ve covered the topic multiple times here at MyShingle. But as The Law Shop’s principals Amy Skogerson and Andrea McGinn discovered that unbundled services were a natural fit for rural communities which are often under-lawyered and are home to self-reliant people willing to do some of the legwork themselves. 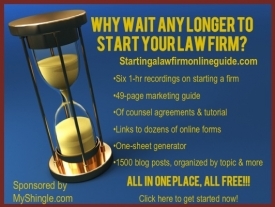 Unbundled legal services are also in synch with the thrifty midwestern mindset: for example, a lawyer may offer a package divorce plan with all the bells and whistles for $5000 when all the clients want is for an attorney to review or e-file their forms. In the meantime, adding unbundled services to their menu of offerings has fueled the growth of the Law Shop. McGinn and Skogerson are expanding their office space, adding a 2018 grad, and gearing up to provide training to other rural lawyers seeking to offer unbundled services. Do you offer unbundled legal services as part of your practice? Why or why not? Please share your comments below.